But first of all, let’s throwback to a couple decades ago. 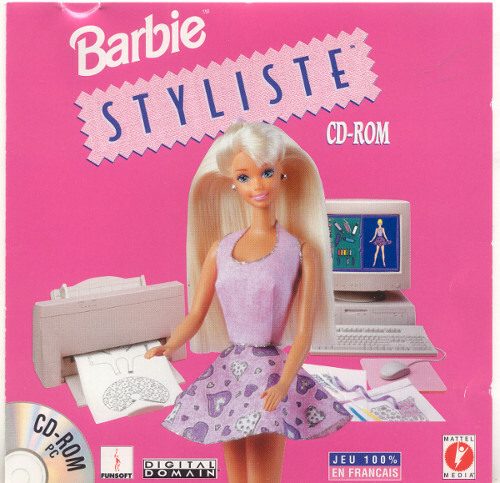 When I was 8, my brother, my sister and I got our own computer, and with it my very first CD-Rom: Barbie Fashion Designer. With Barbie Fashion Designer, you could pick clothing patterns, choose prints and add colors to create Barbie’s wardrobe. Once you had designed a garment, you could see Barbie model it in 3D, and print the pattern on a special woven fabric. Then you just had to cut the pieces (which were printed on a white background) and assemble them using glue and velcro straps and you could make clothes that Barbie could actually wear! Well let’s say that Sprout Patterns is basically a reboot of Barbie Fashion Designer where you are Barbie and you print your garment on actual fabric 😉 . You start by creating a project, composed of three elements: the pattern, the fabric, and the design. Available patterns include both designs by new pattern creators launching their brands, and staples of the indie community (Colette, Grainline, Named…). The common thread is that all of these patterns are easy to fit: either they are made from knits, or they have a loose, relaxed cut that requires no fit adjustments. No structured and fit-and-flare dresses here! 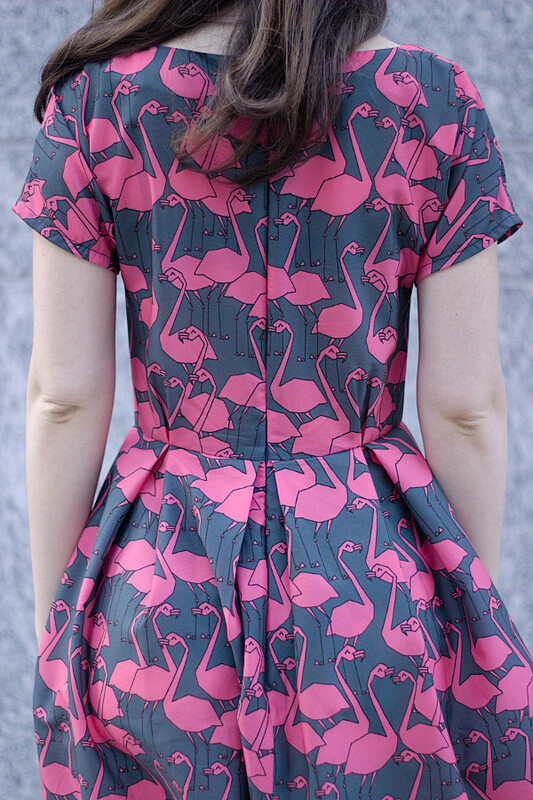 I picked the Zeena dress from By Hand London, which was the closest to my usual silhouettes. I didn’t really care for this pattern when it came out: I think the pink sample really missed the mark, as it looks way too big for the model. The pretty Zeenas made by Fiona of Diary of a Chain Stitcher in voile and double gauze me reconsider, and convinced me to try one more BHL pattern. After selecting the pattern, you need to pick a fabric type. Instead of letting you choose any of the available Spoonflower qualities, Sprout Patterns offers a pre-selection of fabrics that would work with each pattern. For Zeena, I could go with different cottons (batiste, sateen…) or with polyester faille or crepe de chine. I picked the poly crepe the chine: I already had a sample of it and it is beautiful, very soft and light. 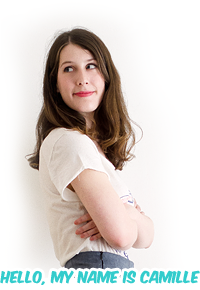 Choosing the print is much harder: the Spoonflower design library is huge! To make things easier, Sprout Patterns implemented a design palette system that lets you search designs using various criteria (designer, theme, colors…) and save them for later. I really wanted a toile de Jouy dress, and I figured I could take advantage of the Sprout system to use a different design on the top and skirt parts of the dress: Dr Who on top, and Star Trek on the bottom. But Nicole had warned me that designs with a white background could be pretty transparent of certain fabric qualities, and after checking the samples I realized that it would be the case for the poly crepe de chine. Zeena’s facings would have shown through, and I didn’t want to have to buy extra fabric to line the dress entirely. 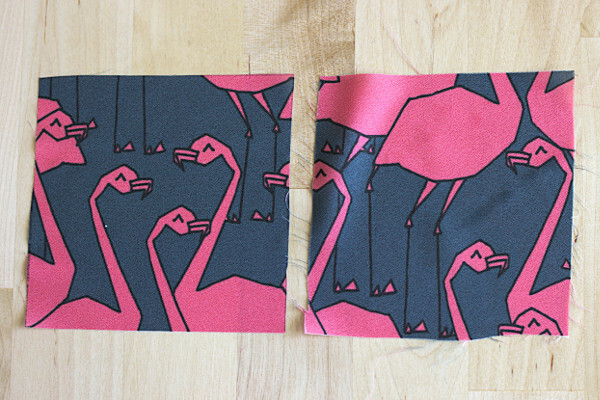 I moved on to plan B: a flamingo print (apparently I am still obsessed!) by Andrea Lauren, Spoonflower’s most prolific and popular designer. The website lets you move the print around on the cutting layout, which updates a 3D rendering of the project. For those of you who are as curious about the technology as I am: the 3D model for each pattern is created by hand by Nicole. I had heard about a research team who proposed a few years ago a system to generate automatically 3D models from Burdastyle patterns (the video is worth watching if you are not turned off by the monotonous tone of research presentations 😉 ), but this is still very preliminary work! Anyway, I think being able to visualize how the print looks on the pattern in 3D is really cool. There are still some limitations however. 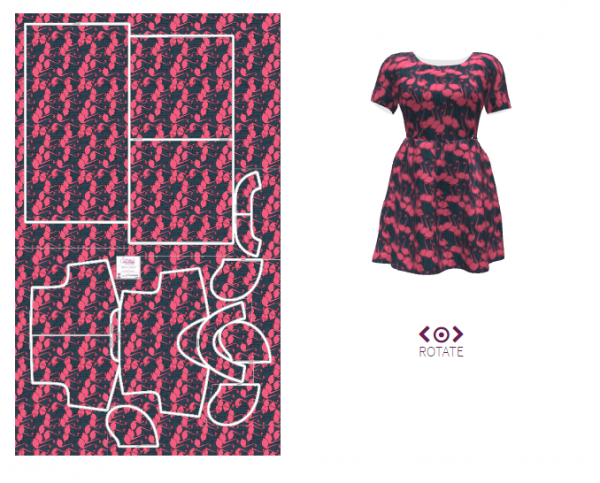 The first one is that it is not possible to match the pattern along the seams, neither automatically nor manually, as you can’t change the print placement for individual pattern pieces. The second one is that the 3D preview is only an approximation and does not reflect the exact print placement. 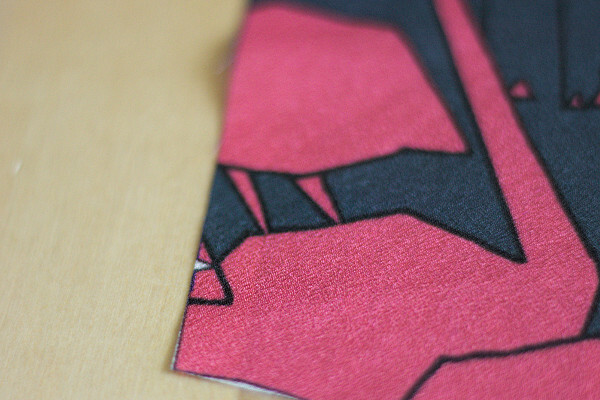 In order to avoid print placement mishaps (let’s say a flower right on the bust apex for instance) you need to refer to the cutting layout, which is an exact rendition of what the printed fabric will look like. You can see this on the side-by-side below: the global look is the same, but the exact print placement is different between the 3D preview and the finished dress. A few days after creating my project, I received in the mail a package containing the fabric, with the outline of the pattern pieces printed in black with a thick white border. No sign of discoloration (the dark spot on the picture is just water, oops). As indicated on the fabric description, there was no shrinkage either. Note that for other types of fabric, the estimated shrinkage is taken into account in the cutting layout. One aspect that I appreciate with Spoonflower is knowing where the fabric comes from: everything is printed right here, in North Carolina, and with the exception of a few qualities such as the silk crepe, the base fabrics are produced in mills located in the U.S. (Spoonflower works with the Robert Kaufman mills, for instance). 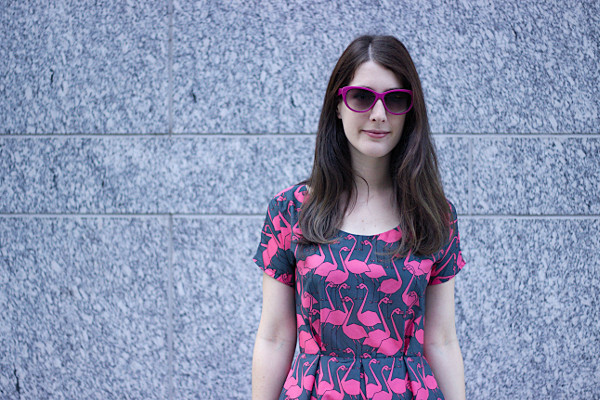 This poly crepe is really nice: it is very light but completely opaque in this color, and the print is bold and vibrant. The only issue I have is that it generates a lot of static: it’s not too much of a problem for a summer dress but I would avoid using it for winter clothes to wear with a sweater or tights. Moving on to the most important part: cutting and sewing the project! Using a rotary cutter, it took me around thirty minutes to cut everything out. I would say that, all in all, I saved one to two hours of assembling and cutting the PDF pattern and transferring it to the fabric. The pattern pieces don’t have markings to indicate their numbers, but a legend next to them that you can cut out and pin. One aspect I was worried about was the pattern markings for pleats, darts, and so on. Here, the pleats were indicated by small notches on the edge of the pattern pieces. However, these notches are very tiny, and it’s easy to miss them or just cut them out accidentally if you are not careful. I actually was missing a couple for the skirt pleats – in the center front and back sides – and I had to look them up on the PDF pattern to form the pleats (the cutting layout has since been corrected to include them). Cutting the fabric was a very strange experience. On one hand, I felt really relaxed not having to worry about placing pattern pieces on the straight grain, matching patterns or making sure I optimized my cutting layout enough to fit all the pieces on the fabric. This is usually my main source of stress when I sew and being on autopilot for this part was great. On the other hand, I was terrified of cutting the pieces because I felt that one slip-up of the rotary cutter would ruin the whole project, as I wouldn’t be able to re-cut any of the pieces or decide to use the rest of the fabric for something else. In the end everything went great, both with cutting and sewing the dress. The crepe was a bit hard to handle, and it took me some time to find the right settings for stitch length and tension (especially on the serger) but once I had those it worked out fine. I even ended up using french seams for the shoulders. However, I have some reservations on By Hand London’s instructions and construction methods for this dress, as was already the case for Elisalex and Flora (which I still haven’t shown you). Some of the seam allowances (bodice side seams, waist seam) are left unfinished, and the zipper instructions are confusing at best. They tell you to press the facing downwards to the inside of the dress and seem to indicate to attach the zipper on both the bodice and facing, when really the facing should be left free and be hand-stitched down at the end. The facing is also not interfaced, and under-stitching it is indicated as optional, but with no interfacing or under-stitching it would really peek out on such a scooped neckline, especially in a thin and fluid fabric like this one. Anyway, none of this was blocking in making this dress, but for a beginner I can see these instructions being a problem. I do like the finished dress. The pattern is definitely a good match for Sprout Patterns: the pleats in the bodice and the kimono sleeves can work with many different body shapes without adjustments. I especially love the fabric: its joyful print and breeziness make the dress perfect for long summer days. Unfortunately it has a major flaw: it is way too short for my taste. Since I am 5’9”, I usually lengthen the bodices and skirts of dresses I make so that the waistline hits my natural waist and the skirt is long enough for me to feel comfortable. The waistline here is okay (a bit too high but that’s alright) but despite doing a baby hem as small as I could on the skirt, I still wish I could have lengthened it. • The poly crepe de chine is 52” wide, so according to the pattern you would need 2,4 yards to make Zeena. • Spoonflower sells by the full yard, so that means buying 3 yards, which would come to $69. 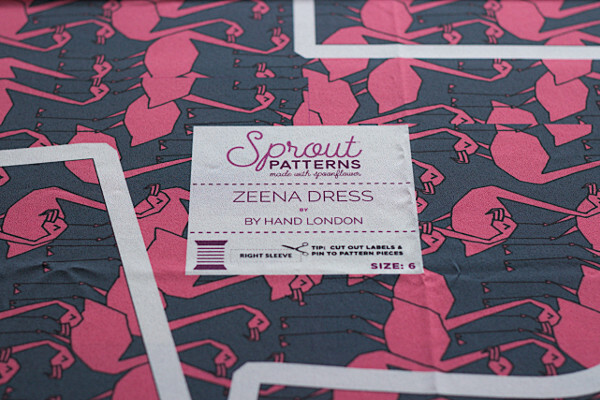 • The PDF pattern for the Zeena dress (which is included in the Sprout Patterns project) costs £9, so $12. • This amounts to a $81 total if you buy the fabric and pattern separately, instead of $70 for the Sprout Patterns project! This may be an edge case, as the extra fabric is expensive (I would personally try to fit Zeena in 2 yards only), but we are still far from the price difference that I was expecting. 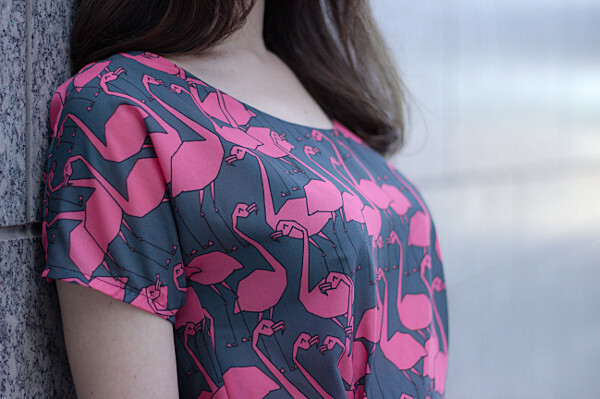 Let’s put aside the financial aspect, which is not that significant from the moment you decide to use Spoonflower fabric anyway, since it is pretty expensive to begin with. What is the point of getting a pre-printed pattern? Apart from the novelty aspect, it comes down to one thing: being able to skip the tedious steps of taping together a pdf and preparing the fabric, i.e. saving time. But it comes with a price, which is not being able to adjust the pattern (length, FBA, etc.). It’s up to each sewist to decide what they value the most: a quicker and easier sewing project, or a better fit. I had a great time imagining and sewing this dress. The website that lets you experiment with patterns and print and see the result in 3D is a lot of fun, as is cutting into the pre-printed fabric. I love the finished dress, with its print that makes me smile every time and its loose yet flattering cut, even though I am still a bit uncomfortable with the short length. That being said, I can’t shake the feeling that I am not really in Sprout Patterns’ target audience. I have been serious about sewing for about ten years now, and I put a lot of efforts into selecting patterns that will fit my body and adjusting them to my exact shape. I am lucky enough that I have a pretty standard morphology in my upper body and in general I don’t have to make a lot of adjustments apart from length. But I could imagine other seamstresses who would have a similar level of sewing experience and would be thrown off by the limitations of having pre-printed patterns. In the near future, it is likely that the technology will evolve and allow for further customization and automation: adjusting the pattern automatically based on a series of measurements, changing the print scale or matching it at the seams… There are only 5 people in Sprout Pattern’s team, so these things will take time, but I am really excited to see what they come up with! However, for those of us with a certain experience level in sewing, this service will always be limited compared to the infinite possibilities offered by a “manual” sewing process associated with classic on-demand fabric printing. I can definitely see the appeal for a different audience. When I started sewing, tracing the pattern and deciding of a cutting layout was my least favorite part. I also didn’t know anything about adjusting patterns, and was just making everything as-is, using my basic bust/waist/hips measurements. Back then I would have loved to have access to something like Sprout Patterns, which would have allowed me to skip all these tedious steps while making sure that I wasn’t messing up anything while cutting my fabric. Would I buy another project from Sprout Patterns? Probably not. Maybe if I had a larger sewing budget (for now I can’t afford Spoonflower fabric on the regular) because I enjoy the time it saves, but the patterns that are offered are not really my style (I like garments that are very fitted at the waist) and the length issue is a bit of a deal-breaker. Would I recommend Sprout Patterns ? Yes, but not to my friends who have already been sewing for years. To them, I would recommend buying Spoonflower fabric and making a muslin in a cheap fabric before cutting into it. I would however recommend Sprout to 1) someone who has a lot of sewing money but little sewing time, or 2) someone who is starting to sew, has tried a few very simple projects first, and most importantly who loves prints 🙂 . There’s no doubt it’s a cute frock, and a clever idea. Great review – I always enjoy your frank but fair take on your projects. OMG I also had Barbie Fashion Designer! I LOVED designing the outfits (but the kit came with the worst velcro ever and her outfits never stayed on haha). Thanks for such a thorough and honest review of Sprout. I love the concept, but at 5’10” I need to make the same adjustments as you and I think not being able to add length to my projects would be a deal-breaker. Your reviews are so great. 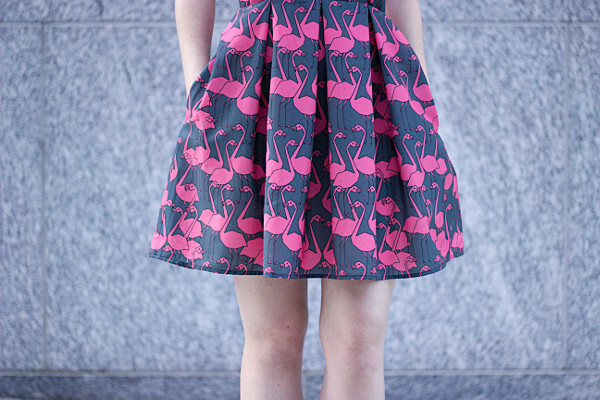 Always honest….. Love the flamingos! and I have to say I admire your guts in tackling another By Hand pattern – I only tried once – I think it was anna – and was so shocked by the drafting that I never tried another one! On a less superficial note, my sympathies for Bastille day and I really hope your family and friends are find…. wtf? Why is France being targetted soooo much??? To be honest I’ve worn this dress a lot in the summer because it’s so light so I don’t mind the length as much now that I got used to it, but these are great ideas! Thanks for your honest review! I feel like this is the kind of thing I would have loved when I was just starting sewing–a project where most of the intimidating work was done, and I could just cut and sew. It seems like it would be a great jump-start for a beginner. Great review, I would definitely go for the good fit, and I’m nit standard. I still love your dress though, the fabric is fantastic. You make a really great point! I’ve been wanting to try them for a while after reading some great feedback on GOMI but haven’t gotten around to do it yet. I hadn’t heard about the “design your own pattern” feature though, this sounds amazing!! 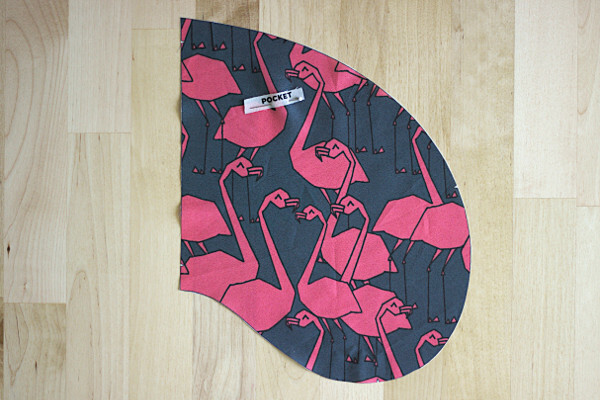 Thank you for such an honest review and sharing all of your thoughts, I have often wondered whether it would be a good idea but because everything I make at least needs a fba I’m not sure it would would but it’s good to know the fabric is decent from Spoonflower. 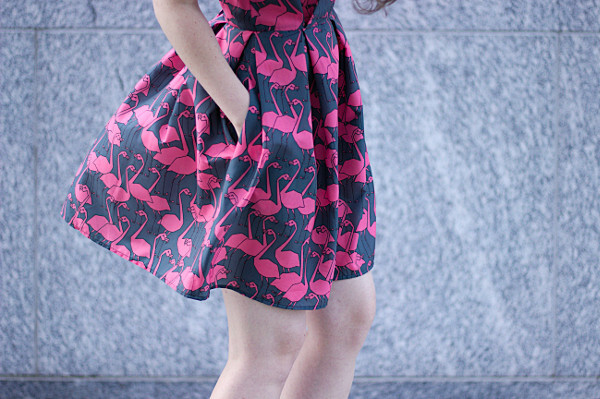 Your dress is lovely, I love the vibrant flamingos! I so enjoy reading your reviews, it’s a nice break from all the fan girl/ sales pitch blog posts which come up about both By Hand London and Sprout Patterns. The other fact I’m not sure about, when you get a Sprout Pattern, is it a one off, meaning you can’t make it again? I’ve never bothered looked into it to purchase one due to 1.cost 2.postage costs to Australia, and 3.too many pattern adjustments needed generally. Haha I’m so glad you had Barbie Fashion Designer as well! I remember the loading time… that was so frustrating! this is a great review of Spoonflower/Sprout patterns . . . and right on target. My website link is to a really fun set of curated Sprout designs. I have teamed up with about 18 other Spoonflower designers (an international group of designers who are all on the visionary, super-creative side) We have found that pairing up our varied stylistic approaches has an amazing synergistic effect. We began the project as an attempt to become visible within the vast ocean of designs on the site. It is my personal hope that Sprout Patterns will incorporate an approach similar to that of Unique Patterns, where a client could plug in their measurements and have even the pattern custom made to their individual shape. AND I am totally with you on the skirt lengths . . . I wish that all of the patterns had skirt length options!!. 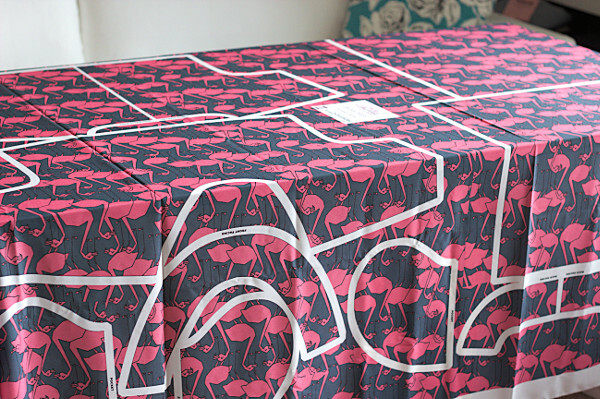 This is a really great idea, Spoonflower design selection can very overwhelming sometimes!